Singer Neha Kakkar has won millions of hearts with her magical voice. However, the actress recently hit the headlines over her break-up with actor Himansh Kohli. The two made their relationship official a few months back on the show, Indian Idol 10, but broke up soon after that. They unfollowed each other on Instagram, and after this, Neha took to Instagram story and wrote, "I know now everybody's gonna talk about it now. People are gonna judge me... Some people are gonna say things which I haven't done but koi nahi, muhje aadat ho gayi hai sab sune ki. (no problem, now I'm used to listening)." The two have parted ways for the reasons best known to them. After a long time, Neha Kakkar has finally spoken up on what made her to end her relationship with Himansh Kohli. Ajay Devgn says he was shocked by the #MeToo allegations against some of the prominent names in the Indian film industry, but he believes that a due course of law should be followed in such cases. Several Bollywood personalities such as directors Rajkumar Hirani, Subhash Ghai, Sajid Khan, Vikas Bahl and Rajat Kapoor, actor Alok Nath, singer Kailash Kher and music composer Anu Malik were called out for sexually harassing women over the years. "A couple of things came out and some people are like this but everybody is not like that. I would say some names did shock me but then I can't be judgmental completely till somebody proves someone guilty or not," Ajay said to media. 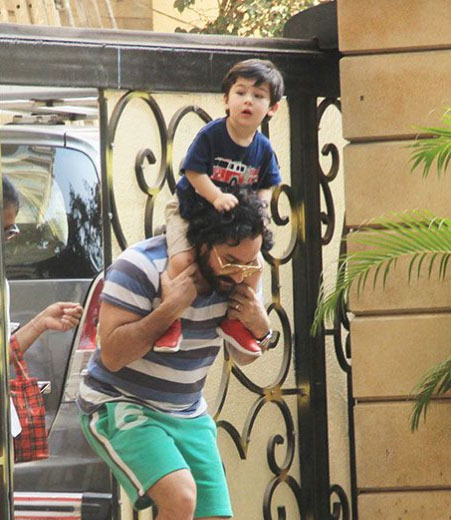 Taimur Ali Khan took a piggyback ride with papa Saif Ali Khan to get rid of the Monday blues. While we have caught the munchkin on horse rides quite often, he is seen perched on his daddy’s shoulders more often than that. Nevertheless, a mere glimpse of Taimur has made our day. Alia Bhatt is all over the place because of her interesting line-up of films, and also due to her relationship with Ranbir Kapoor. The actress admitted on Karan Johar's chat show that she is seeing the Kapoor boy, and she has already decided the name of her daughter. During the promotions of Gully Boy, when the young actress visited the sets of a dance reality show, a participant misspelled her name as Almaa. Uri: The Surgical Strike is roaring at the box office and how. The total business of the film now stands at Rs 212.78 crore making it an all-time blockbuster. Vicky Kaushal and the team have every reason to rejoice as it has beaten Baahubali 2 when it comes to fifth-weekend collection. Shah Rukh Khan has finally confirmed that he is joining the team of Sujoy Ghosh's Badla along with Amitabh Bachchan. The filmmaker is known for his thrillers like Kahaani and Kahaani 2. SRK had said to media that he would start work on the project after Zero, and we guess he might begin shooting from tomorrow. He plays the part of Taapsee Pannu's husband in the film. The film is a thriller where a businessman gets arrested for the murder of his married lover.